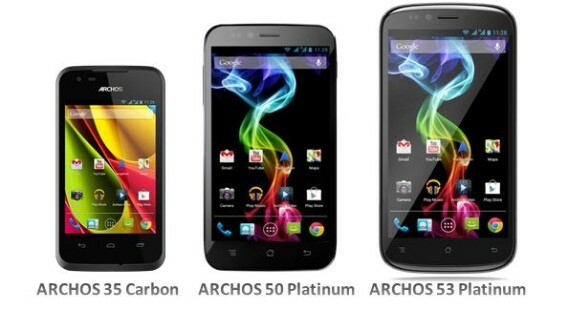 It looks like Archos just shook up the cell phone market with three new Android entries, the 35 Carbon, 50 Platinum, and 53 Platinum. They may sound like a pretty minor blip in the world of SamApp iGal5xxx mega machines, but what they represent is probably more important than the big boys products. The phones themselves are nothing special, pretty run of the mill Android 4.1 devices with nothing to amaze or astound. Any feature list is usually highlighted by the screen sizes, 5.3″, 5.0″ and 3.5″ for the 53, 50, and 35 respectively, imagine the coincidence. What is interesting is that they are all IPS screens, quite a nice touch for such an inexpensive phone. Resolutions are 960*540 for the Platinums and 320*480 for the Carbon. These are about where you would expect them to be, other than being IPS nothing stands out. Moving on to the CPU however there is something new, Qualcomm’s quad-core A5 based 8225Q at 1.2GHz on the Platinums and a 7225A at 1GHz on the Carbon. The new part is not the core, that is ancient, but the simple fact that they are quad cores in the higher end phones. Both the big phones have 1GB of DRAM and 4GB of flash, the Carbon only has 512MB of DRAM, but all have microSD slots. The Platinums have 8Gp cameras in front, 2Gp in back, their little brother has VGA for both. Other than that, most everything is about what you would expect with two exceptions, first off they all have dual SIMs. This may not sound like much but it is so amazingly handy to have, once you go there it is hard to go back to one. Carriers obviously hate this feature but consumers love it. This is the long way of saying the Archos phones are sold directly and unlocked, not subsidized. The cost is quite reasonable too, $99 for the 35, $219 for the 50, and $249 for the 53. The other notable exception is batteries on the bigger two phones. The 50 is slim at 8.9mm so it ‘only’ has room for a 2000mAh battery but the 53 is .35mm thicker and .3 inches larger diagonally so it can cram in a 2800mAh battery. This may not sound impressive but most modern phones have both a more power-hungry CPU/GPU and make do with a 1600-1800mAh battery. The 8225Q should be pretty light on battery so that 2800mAh in the 53 could last a very long time. The skeptic in the back of my head is screaming something about, “This is a necessity to make up for crappy, power-hungry hardware Archos put in to meet a price point”. Given Archos’ history of tablets and players, they haven’t done that kind of thing in the past so we will give them the cautious benefit of the doubt this time. No thumbs up until we get one in-house though. If the above sounds like a low-end phone with a big screen and somewhat dated hardware, you get most of the point. The part you are missing is that it hits just about every check box for sales chart in big box stores. People buy based on perceived performance so a quad-core beats a dual, right? This may be the height of consumer stupidity but it is an unavoidable fact of modern life. Because of this list of ‘features’ and the price, I think the Archos triplets will do pretty well at retail. Much more importantly is the impact this will have on the industry, essentially what these phones and may like them portend. These aren’t just another batch of off-white box models that will make the LG’s of the world look good in a lineup, they are the future. These three, and the 700 others you don’t hear about are the worst nightmare for Samsung, Nvidia, and any other bigger players. Why? Long story.